Hammond, Darell. KaBOOM! : how one man built a movement to save play. Rodale Books : Macmillan, 2011. Darell Hammond, CEO and founder of KaBOOM!, is speaking in Geneen Auditorium at Fuqua at 6:30 on Tuesday 10/4 to discuss the challenges he faced in growing his nonprofit from a 2 person startup to a national organization, which leverages the power of local communities to construct playgrounds in disadvantaged neighborhoods. Since 1995, he has raised $200 million and constructed 2,000 playgrounds throughout the US. Hammond is also the author of a new book titled KaBOOM! about his life, career and company. Hammond begins his book with a description of his childhood where he has a rough start, one of 8 children abandoned by his father. Yet he thrives under the discipline and guidance in a group home near Chicago. He describes his early career – the people he meets and the experiences they share, which help him develop the principles that guide KaBOOM! today. 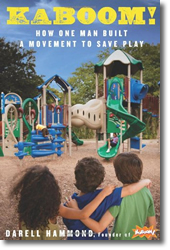 For Hammond, the process of building the playgrounds is as important as the end product. KaBOOM! provides the tools, resources and guidance for each project, but the local community is also involved, organizing the project, soliciting funds, and providing the labor. When the project is complete, the volunteers experience a sense of pride in their accomplishment. They are transformed into a community working for positive change. They continue to maintain the playground for the children and they apply the planning and organizational skills to other projects in the community. Written with passion and commitment, this is a story about the power of an individual to be a force for good in the world. It is also a chronicle of an entrepreneur who develops a business model, nurtures his organizations expansion and standardizes the process and procedures. Without formal management training, he makes mistakes and describes what he learns from them. This engaging book offers practical points on social enterprise. This entry was posted by Meg	on Monday, October 3rd, 2011 at 8:00 am	and is filed under Book Reviews. You can follow any responses to this entry through the RSS 2.0 feed. You can leave a response, or trackback from your own site.